In food processor, place 1 cup mango and the nectar. Cover; process until smooth. Stir in mint. In medium bowl, gently mix remaining 1 cup mango, the strawberries and mango-mint sauce. 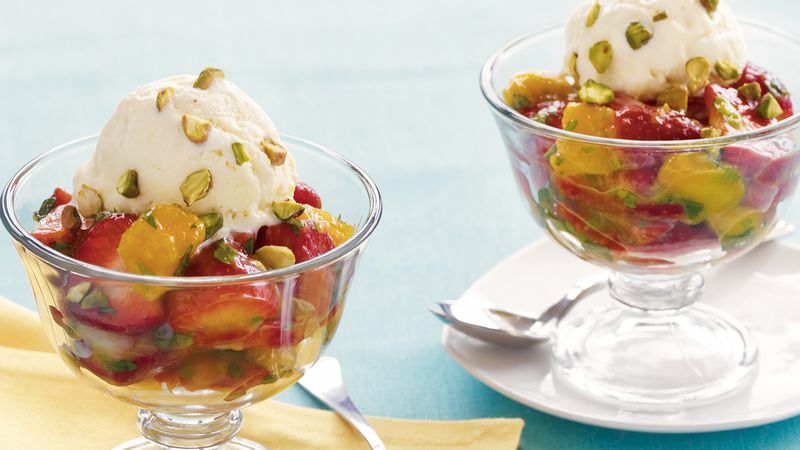 Spoon 1 cup strawberry mixture into each of 4 dessert dishes; top each with 1/3 cup ice cream and 2 teaspoons nuts. Pistachios have a delicate flavor. Substitute macadamia nuts for a heartier, buttery-rich flavor. Because macadamia nuts contain more fat than pistachios, use 1 teaspoon per serving.